Valentine's Day is just around the corner. 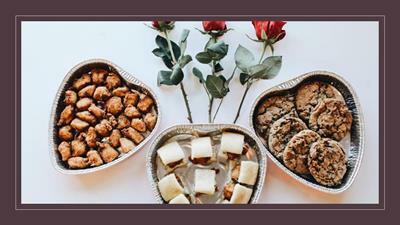 Order a 6 Count Cookie tray , Small Mini tray or 30 Count Nugget tray for that Special someone. If you order online add in the special instructions section, "Valentine Special" and we will include this Special Heart Shaped Tray that includes a lid. Order online only for the special, while supplies last. ??? ?